Uptown will get even more meaty when a Fogo de Chao opens in the One Uptown building at 2619 McKinney Ave. 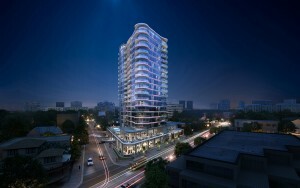 The Brazilian-style steakhouse will go on the ground floor of this new residential high-rise, due to open in mid-2016. This will be the second branch of Fogo de Chao in North Texas. The other branch in Addison was the very first Fogo when it opened in 1997, and among the first to introduce the concept of cooking Brazilian meat over an open fire and carving it tableside from skewers. One Uptown will boast 20 floors with 198 luxury apartments, a 490-space parking garage, and 26,160 square feet of retail and restaurants. The Fogo de Chao is anticipated to be a new flagship for the chain, embodying a new urban-style personality with an in-house “Bar Fogo” as well as an expansive street-side patio. Fogo is one of two restaurant tenants going into the One Uptown building. The other is Style & Grace, a two-story restaurant-bar from Peter Lloyd, jet-setting owner of Fat Rabbit, the bar-restaurant that opened right across the street in the old Sfuzzi’s space in January 2015. Style & Grace will encompass a restaurant on the first floor, an after-dinner lounge on the second floor, a large patio that wraps around the corner of the building, and a pool bar with a 6,000-square-foot pool deck. Rick Cavenaugh, president of Stoneleigh Companies which is One Uptown’s developer, is looking at a fall 2016 opening date for the restaurants. “We just poured concrete on the 10th floor and it’s a 20-story building, so we’re expecting to top out the building in May,” he says. Fogo will take the north half of One Uptown’s restaurant space, facing McKinney Avenue. Style & Grace will look out on Routh Street. Uptown is turning into carnivore alley, with branches of Perry’s Steakhouse & Grille and Morton’s, which moved to Uptown in 2011 from its longtime perch in downtown Dallas. Less than a mile away, there’s a Texas Land & Cattle, with a similar churrascaria concept as Fogo, and a coming-soon Del Frisco’s Double Eagle Steak House, opening at the McKinney & Olive, the office and retail tower, in fall 2016. Meat, everyone! Construction has been underway since July on the One Uptown apartment tower on McKinney Avenue. The luxury apartment tower is being built on the site of the old Hard Rock Café at McKinney and Routh Street. The 20-story project will have 198 luxury apartments and 18,000 square feet of retail when it starts opening at the end of the year. There’s also going to be a rooftop pool. Dallas investor and developer Paul Cheng and Stoneleigh Cos. are building the high-rise. A new architect’s rendering shows what the curvaceous tower will look like at night with colored LED lighting. “We should pour the ninth floor Wednesday,” said Stoneleigh president Rick Cavenaugh. “Windows start going in next week. Cheng and Cavenaugh are also working on a mixed-use project in Frisco that includes a farmers market, apartments, office and retail space.